We have been keeping a watch on Indian brands for some time now. We identified some brands that are consistently doing great. So, we thought to dig deeper, decode their secret and share them with you. When creativity is concerned, you can't ask for more. They know their audience. They understand what would make them use their service. They always succeed to turn the foodie-self on in you. They don’t follow a strict post-everyday rule on social media. Obviously, quality means more than quantity for them. Their audience knows it and eagerly await the new content. They are equally good on every network, be it Facebook, Twitter, Instagram or blog. Experts keep saying that using a plethora of social networks may ruin your marketing. But Zomato shows us how to utilize multiple channels for content marketing and that too with great efficiency. The mantra of success: Producing great content in an optimum number, and promote them well on social networks. 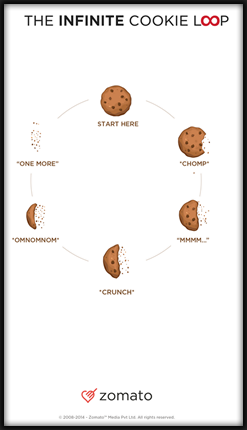 Oreo India has successfully cracked the code to keep their audience engaged with their content. The challenges were greater, as when they entered into Indian market, it was already dominated by brands by Britannia and Parle. So, they started with a brand awareness campaign with#DailyDunks with Bollywood’s heartthrob Ranbir Kapoor. They come up with different content ideas for different networks. And what’s unique about their content? They focus on their product for every piece of content, they share on social media, just like the above Instagram post. Oreo India is present on Facebook, Twitter, Instagram, Pinterest, and YouTube. Apart from that, they have TVCs, featuring Ranbir Kapoor. They don’t miss a single occasion to engage their audience. This is the USP of their content strategy. However, there are still scope for improvement for their Pinterest Marketing. The mantra of success: Engaging content, focusing the product. A celebrity association made it through offline content marketing as well. 9 out of 10 brands will shy out, if you ask them to take a stand on a social issue. But Amul, famous for their topical stories, is definitely an exception. Be it any cause or issue, Amul is always there with its opinionated version. All the creatives of Amul focus on the point of view of the mass to address any social situation. And you will find the ever-green Amul girl in each of their content, as if she is conveying the story from her perspective. This makes the brand different from others. Amul is present on Facebook and Twitter. They often conduct interesting social media contests to engage their audience. They also have a blog, but it’s pretty inconsistent. The mantra of success: Amul understood the mantra for reaching mass’s heart like no other did. The approach of Vogue is completely different in India. While they continue to be the industry expert for fashion and lifestyle, they take the lead in addressing social issues with #VogueEmpower, an initiative to raise awareness on women empowerment and violence against women. They feature Bollywood celebrities in their videos, which add glamour and at the same instant buzz to their content marketing efforts. However, the biggest weapon, they use in their content marketing, is powerful storytelling. Even though YouTube plays the major role in their content marketing, they are also present on Facebook, Twitter, Instagram, and Google Plus with a significant fan-following. After all, they belong to a widely talked-about niche. The mantra of success: Star power worked for the brand. Apart from that, there is great storytelling. Their videos deserve a special mention here. They are funny, topical and highly engaging. FlipKart is one of those pioneer Indian online brands that adopted TVCs as a primary player for their content marketing. Be it a new offer or a service announcement, Flipkart always brings smile on their customers' face with their creativity, messaging and sense of humor. Most of the ads are shot by child actors, which essentially increases the likability factor. The mantra of success: Great re-marketing strategy, customer interaction, compelling offers and engaging content. Wedding is a serious business, but when it gets the spicy touch of shaadi.com, it becomes interesting. They carefully cover every aspect of marriage, with emotion and fun and that differentiates them from other matrimonial sites. Take a look at this video about what NOT to do with your matrimonial profile and have a LOL moment for yourself. The above video falls under the category of #MeriShaadiKarwao and is hilarious to the core. Similarly, there are other campaigns like “Love, arranged by Shaadi.com” or “Amazing proposals”, which resonate perfectly with their target audience. Like Vogue India, YouTube is the leader of content marketing for Shaadi.com. However, they are present and active on Facebook and Twitter too. But their content marketing strategy for YouTube and TV is completely different from that of social media. The mantra of success: Tapping different shades of human emotions for marriage and express them with a fine sense of humor and story-telling. Imperial Blue is a famous name among whisky lovers. But the brand got the ultimate fame from its “Men will be men” campaign. The campaign is based on video marketing. They understand male psychology very well and it shows in their commercials. TV ads are the major player in their content marketing efforts and they often come up with new videos. Each video perfectly depicts a man’s emotion with a funny angle. And the result is, smiles and laughter and an ever-lasting brand awareness. The mantra of success: Fresh content is the key that works for the brand every time. You must have heard of ‘Womaniya’ song. That’s how OLX India has built their brand recall. True to their tagline, “Where Buyers Meet Sellers!”, all their content pieces cry out one thing. If you have something to re-sell, OLX is the place for you. They help you get rid of domestic clatter - the common pain point of every Indian household. Even though OLX India mainly focuses on video marketing and TVCs, but they are equally proficient on Facebook and Twitter marketing. Look at the above Facebook post. Not only that they create compelling content, targeting their niche, but also motivate them to use their service. And they added the much-needed star-power to their marketing efforts, when they associated themselves with stand-up comedian turned TV star, Kapil Sharma. The mantra of success: Humor marketing, star association and addressing a common pain point of the target audience. Simplify360 is a new-age social media analytics company, started by Bhupendra Khanal in 2009. Their forte is infographics and they have more than 25 big names as their clients to showcase in this category. Here is their take on the Ice Bucket Challenge that went viral a couple of months ago. It’s better to mention here that this startup got acquisition offers from brands like Twitter and Abode. But they chose to undertake the path themselves. They are active on Facebook, Twitter, YouTube, Pinterest, and Google+. The mantra of success: Their unique way of collating, analyzing, breaking and presenting data. Conclusion: Some common factors in all the above mentioned brands’ content marketing.